Who doesn't love our treasured native brock? 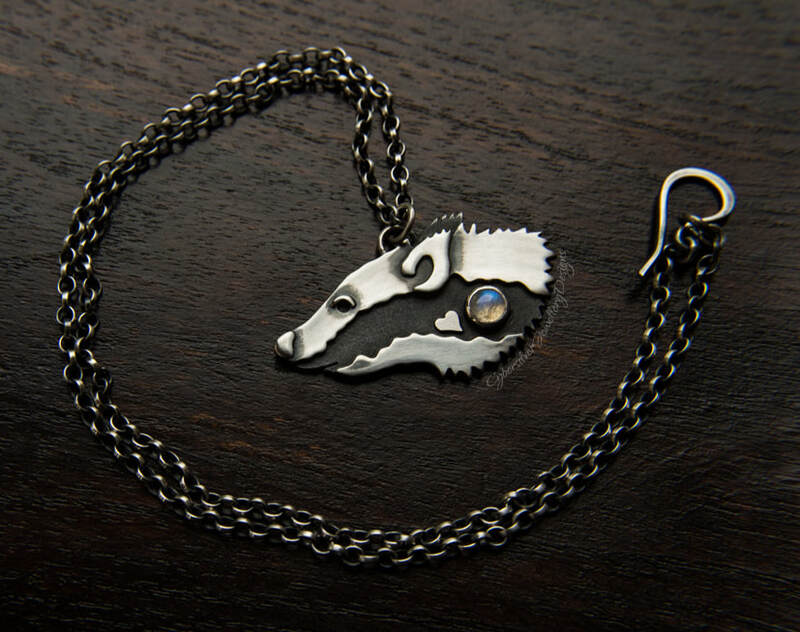 This original badger pendant is my homage to these gorgeous creatures and is entirely handmade from sterling silver......notice his cute heart? He is created from hand cut layers of sterling silver and is set with an iridescent blue moonstone gemstone. He hangs from an 18" sterling silver chain which is finished with one of my handmade silver clasps. The silver has been oxidised, brushed and waxed to highlight the detailing and help protect the oxidised surface. ​On his reverse shuffles a 'secret' badger. As each badger is handmade please allow for slight variations. Chain length - approximately 18"
This pendant is handmade to order so please allow up to 15 working days for completion of your order.